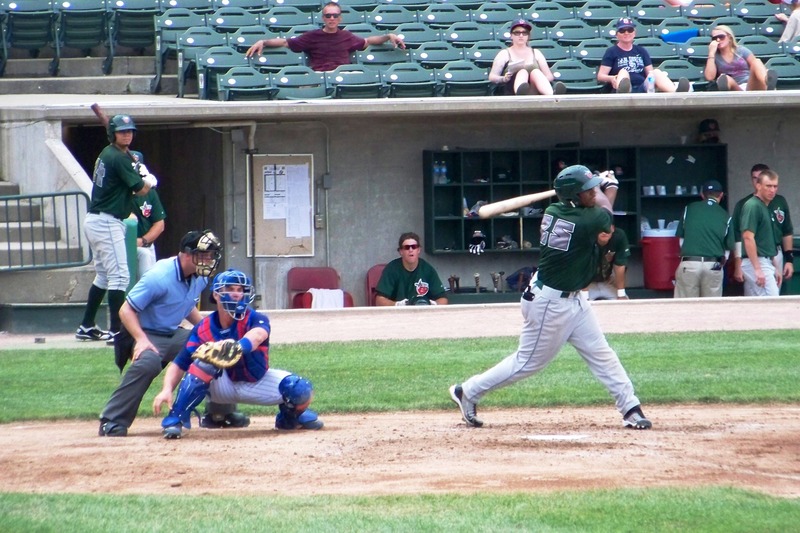 Rymer Liriano swings at a pitch while playing for the Fort Wayne TinCaps in 2011. Rymer Liriano, a San Diego Padres top prospect, is out for the 2013 season after tearing the ulnar collateral ligament in his right elbow while playing long toss in the Dominican Republic in late December. He will undergo Tommy John surgery Wednesday in San Diego. The Padres hope he will be able to swing a bat in six months and play in the Arizona Fall League and the Dominican Winter League in nine months. He was coming off a strong showing in the Arizona Fall League in which he hit .319 with 4 HR and 15 RBI in 22 games, and was expected to start the 2013 season with the Double-A San Antonio Missions. 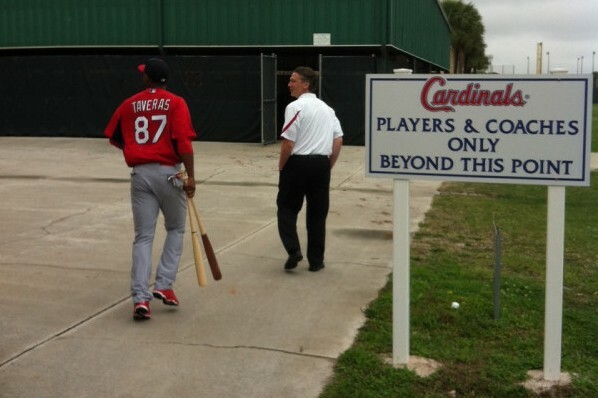 Oscar Taveras heads to BP on Friday in this photo tweeted by Cardinals beat writer Derrick Goold. During the early days of spring training, it seems all eyes on some of the top prospects in baseball. There are three former Midwest League players in particular who have been showing up a lot in my Twitter feed lately. A year after he was hung with the nickname “Minor League Guy,” top St. Louis Cardinals prospect Oscar Taveras hopes to continue proving why he isn’t likely to be known by that moniker for very long. All the buzz in Cardinals camp seems to be about him right now as he is ranked very high among all baseball prospects and should make the major-league roster next year, if not sooner. Taveras won the Midwest League batting title in 2011 when he hit .386 with 8 HR and 62 RBI in 78 games with the Quad Cities River Bandits. Last year he was named Texas League MVP after hitting .321 with 23 HR and 94 RBI in 124 games with the Springfield Cardinals. St. Louis Post-Dispatch columnist Bryan Burwell recently wrote a great story about Taveras that you can find by clicking here. 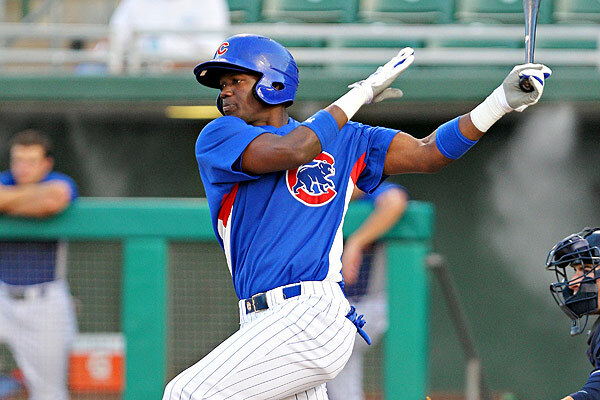 Soler hit .338 with 3 HR and 15 RBI in 20 games with the Peoria Chiefs last year. He is expected to remain in Class A to start this season, either with the Cubs’ new Midwest League affiliate, the Kane County Cougars, or the Class A+ Florida State League’s Daytona Cubs. Incidentally, No. 2 Cubs prospect Albert Almora is expected to start the season with the Cougars. You can read more about Soler and his skills in this recent article by Comcast SportsNet’s Patrick Mooney. 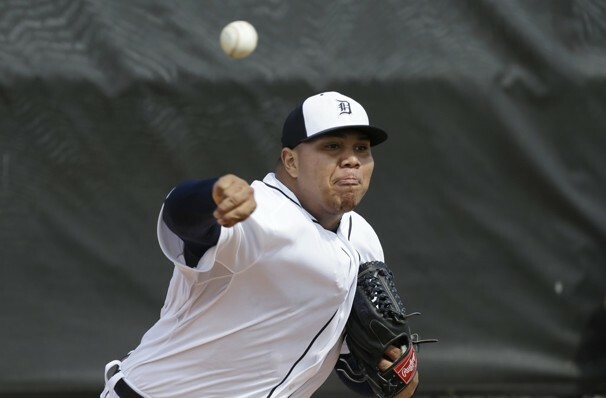 Another former Midwest Leaguer making headlines this spring is Bruce Rondon, who may be the Detroit Tigers’ closer this year despite being a rookie. Rondon is a big guy — he’s listed at 6-foot-3, 275 pounds and physically reminds me of a young Bartolo Colon — but his arm is even bigger, metaphorically speaking. He has a triple-digit fastball that has Tigers fans excited about him, but there also is reason to temper that optimism about the 22-year-old reliever at this point. As this Washington Post article notes, Rondon has 213 strikeouts in 196 minor-league innings, but also has given up 111 walks. Still, opponents have hit only .189 against him and, as this article notes, he was impressive in his first spring training session against hitters. Rondon went 2-2 with a 2.02 ERA, 19 saves, 34 walks and 61 strikeouts in 40 IP for the 2011 West Michigan Whitecaps. This entry was posted in Arizona Fall League, Daytona Cubs, Florida State League, Fort Wayne TinCaps, Kane County Cougars, Midwest League, Peoria Chiefs, Quad Cities River Bandits, San Antonio Missions, Springfield Cardinals, Texas League, West Michigan Whitecaps. Bookmark the permalink. Lots of hype around Rondon. Just hoping he can put all that to the side and just pitch. I don’t think having Leyland telling the press he was going to compete for closer was a great idea. They should have just let him go out there and see what he can do, and if he’s gotten his control issues worked out. This was a really cool post, Craig. I hadn’t heard about Liriano, but that’s too bad. I saw him a couple times in 2011, so I’ve been keeping an eye on his career. Too bad about the arm. Great stuff about Taveras and Soler. (And I had to re-read the post about getting Soler’s auto on the BP ball.) The entire post just makes me even more pumped for the season to start!